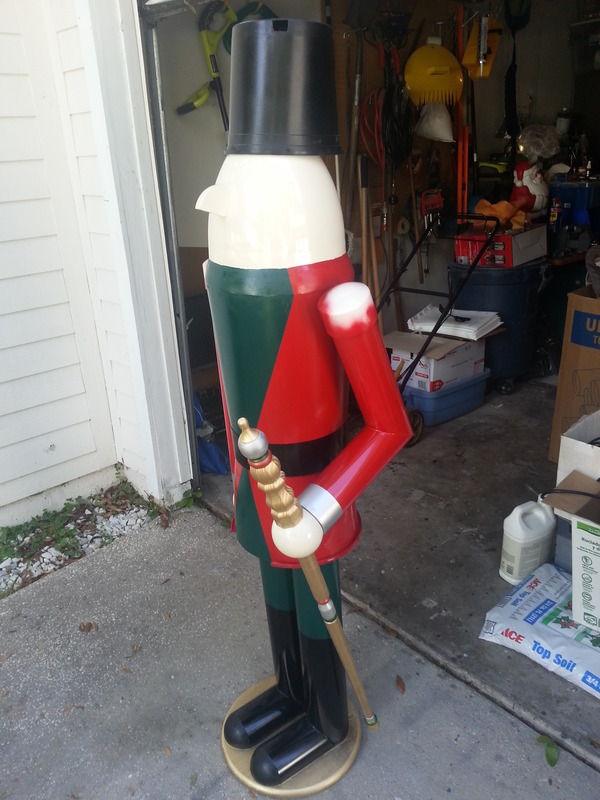 Life size nutcracker using plastic pots, planters, and PVC pipe. I used links so that you can get a visual representation of what I’m talking about and not necessarily for purchasing recommendations. You may already have several of the items and tools listed below. (3) 4 in. X 2 ft. PVC for the legs and feet. (2) 3 in. X 2 ft. PVC for the arms. (2) 3 in. cap PVC for the shoulders. (1) 10 in. round valve box for pelvis/lower body. (1) 13.25 in. X 14 in. classic planter for the upper body. (1) 14 in. X 5.5 in. planter for neck. (1) 9.055-in x 8.622-in Planter for the Fez hat. (1) 12 in. x 10.95 in. Black Plastic Planter for the head. (1) 0.99-in x 14.98-in x 1.25-ft) Radius Edge Spruce Board for base. (1) 2-in X 3-in x 8-ft; Actual: 1.5-in x 2.5-in x 7.9375-ft) wood stud for inside of left bent arm. (1) 2 X 4 X 8′ treated stud for inside the two legs. (1) 1-in x 4-in x 6-ft; Actual: 0.75-in x 3.5-in x 6-ft) Pine Board for arm mounting. (3) 5/16 in. X 6 in. threaded rod for arm and left hand mounting. 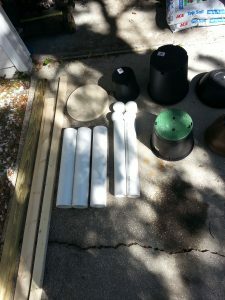 (4) Styrofoam Ball 4 in. for feet and for hands. 3.125 in. X 36 in. X .09 in. (thick) plexi glass for belt. (1) can of Valspar 12 oz gloss lovely bluff color spray paint for face and hands. (1) can of Valspar Plastic Black gloss for boots and belt and fez. (1) can of Rustoleum Hunter Green gloss for pants and under shirt. (1) can of Rustoleum Sunrise Red gloss spray paint 12 oz. for coat. Assorted acrylic paint colors for hand brushed face. Modern Masters Iridescent Gold for gold brushed on detail. Modern Masters Pewter for silver brushed on detail. (1) Table Leg (Actual: 1.375-in x 28-in) for scepter below the hand. (1) 1-3/4 in. Lrg craft finial for top of scepter. (1) Pine End Table Leg for scepter above hand. (1) 5/16 x 9 Aluminum/Steel Hook And Eye Turnbuckle inside of hand for mounting scepter . (1) pair plush leg warmers white for hair and beard. (24in.) Metallic Twisted Cord for top of Fez detail. (4) tassels/chair ties 27 in. for Fez detail. (1) 1 3/4 in. wood ball knob for top of Fez. (1 roll) 7/8 in. X 9 ft. gold ribbon for chest detail. (30 in.) 1.5 in. wide red felt ribbon for lower Fez detail. (1) tube DAP ALEX Plus 10.1-oz White Paintable Latex Caulk for seam work. Lightweight spackle for seam work. Masking tape and paper for shielding off different colored areas of paint. Screw bottom of main upper body planter to top lid of valve box with the 1.25 in. screws. Use at least 4 screws. Set aside for later. 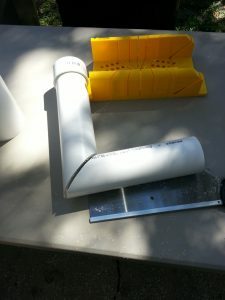 Cut one of the 2′ X 3″ PVC pipes in half with the mitre box at a 45 degree angle. You’ll need to repeat the same 45 degree angle cut for the 2 X 3 wood to go inside the arm for structural support and for mounting hand and then arm to body later. The wood must also be cut the same length each section of the PVC arm is as well. Make the lower part of the arm’s wood a little shorter, though, so the foam ball hand can tuck inside the PVC for another step later. 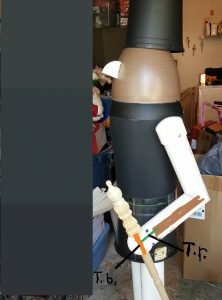 Slide the piece of wood inside what will be the upper arm PVC, drill and counter sink at least three 1/8 inch holes along the middle back of the arm so you can screw the wood inside the PVC snug tight using the 1.25″ drywall screws. 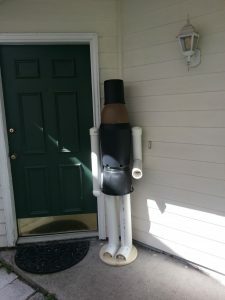 The counter sinking will allow the screws to sink inside the wall of the PVC so you can hide the screw heads later with caulk and spackle before painting to make them disappear. 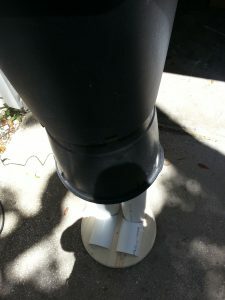 Using the PVC cement, you can then glue one of the 3 in. PVC caps to the upper arm after the wood is set to the top flat part of the arm. (see pic above). Now you can repeat the same with the lower part of the arm making sure the angle of the wood matches the angle of the PVC so when you get ready to put the two arm parts together, the bend of the arm looks right. Once the wood is mounted in each part of the arm you can use the super glue to stick the two parts together along the 45 degree angles making a perfect 90 degree bend of the arm. The super glue is only a way to help hold the arm together because you want to use a 3 in. screw countersunk at the elbow to screw the two pieces of wood together that are inside the arm now. Make sure you pre-drill through one of the pieces of wood so the wood won’t split. You’re doing this somewhat blind because the wood is inside, but you know exactly where it’s at. Set arm aside for later. Mounting the leg parts to the base. Cut (2) 24 in. pieces of treated wood from the 8 ft. 2 X 4 treated lumber you bought to be the inside of each leg. Pick a location closer to the back of the round base where the legs will sit and trace the ends of the boards (about 6 in. apart) and pre-drill three holes inside each traced mark that will fit inside the board when screwed on. Flip the round base over and countersink the holes so the screw heads will be inside the wood and the base will lay flat without the screw heads making the board uneven on the ground. 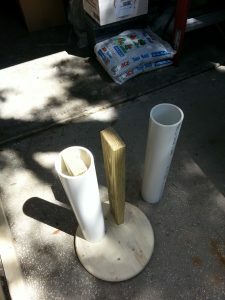 Now you can screw the 2 ft. boards to the base using a total of (6) 3 in. screws between the two–three ea.. Slip the 4 in. PVC over the boards. With the third 2 ft. long by 4 in. round piece of PVC I had you get will need to be cut in half length wise so it is shaped like a long “u”. You’ll only need (2) 6 in. pieces for each foot, but cut as much as you can of the PVC length wise because it’s easier to make that kind of cut as a whole piece so you can clamp it down for ease and safety. The foot pieces go right in front of the legs on the round base and you’ll need to notch the top of the foot so it will fit closer to the legs. I just caulked them down and filled the gaps between the leg and the foot so when dry, the caulk makes a strong seal. One of the 4 in. styrafoam balls will need to be cut in half and then one of the halves be cut in half again for the ends of the feet. Glue them in place with the caulk. With the excess from the treated 2 X 4 you used for the legs you’ll need to cut the length of what the bottom of the inside of the valve box from the body you assembled in step one. Screw the board bridging the tops of the two legs to the wood inside the legs with 3 in. screws making sure it’s centered. Now you can mount the body to the legs. You may need to cut or round off the square corners of the bridged board because the valve box is round on the inside. Screw from the outside of the valve box into the wood on the inside at least two screws per side. Putting in structure for arm mounting. The first part of this step will be cutting the ridge or lip off of the top of the body planter. You’ll see by comparing the pic here to the picture on the first step which still has the ridge on the top. You can do this by using a sharp utility knife. Be Careful! (JPs FX Creations is not responsible for any accidents you acquire by attempting this project). It’s not that difficult with the nature of the pot’s thin plastic properties. Next, using the 1 X 4 X 6′ piece of wood cut a section to fit inside the top of the body which will help hold the shape of the planter and will be accepting the hardware for each arm to be mounted. A slight angle needs to be notched at the ends of the board to fit snug with the tapering of the planter. Use two 1.25 in screws per side for holding in place. Mounting the arms to the body. If you haven’t already done it; glue the 3 in. 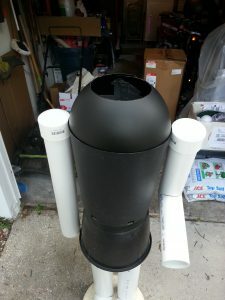 PVC cap on the remaining uncut 3 in. PVC pipe with the PVC cement. 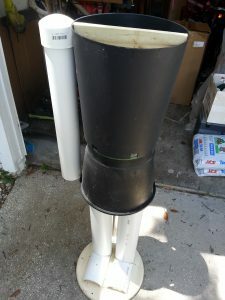 Next you will need to drill a 5/16 inch hole all the way through (both sides of) the cap and PVC pipe at the top or shoulder to be used for mounting the arm to the body. My holes were near the bottom of the cap. You will then need to thread one of the 5/16 threaded rod through the holes so three inches is sticking out from the inside or arm pit area. Because you drilled exactly 5/16 in. hole and the rod is 5/16 in. it may be difficult to twist into the holes, I just put my rod inside the end of the drill and was able to screw it in faster. Repeat the same process for the other arm. Now locate where the arms will fit best and make a corresponding mark where you will drill another 5/16 in. hole through the body into the 1 X 4 piece of wood mounted on the inside. Drill the hole at least 3 in. deep. If you want the arms to rotate, ream the holes in the wood a little or use the next size drill bit up (11/32). Mounting the planter to be the neck area of the nutcracker. For this step you’ll be working with the 14 in. X 5.5 in. pan type planter for the neck upside down. 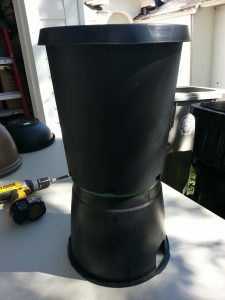 You need to repeat the same process of removing the pots lip or upper ridge with the utility knife as you did with the body planter’s top ridge. Cut the bottom flat portion out completely so you have a large hole that you can reach inside with your arm. (see pic above) You’ll then need to make a vertical cut all the way down the height of the planter so you can adjust its size by overlapping the cut edges. Change the size so it will fit snug inside the upper body and wedge it in between the wood and plastic of the body planter. To help keep the shape of the neck after overlapping to fit reach inside the neck hole and use duct tape along the overlapping edges seam. 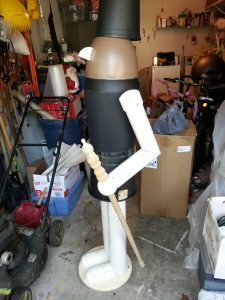 You will also need to duct tape the inside bottom of the neck to the inside of the upper body where they come together. No screws necessary. You can see a hint of the duct taping job I did on the picture above. 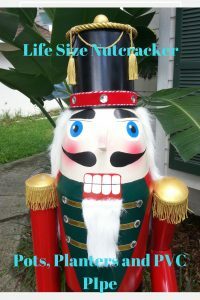 Raw nutcracker in his Christmas home spot. Now let’s get his head and hat on. With the 12 in. x 10.95 in. plastic planter for the head, and after you cut the lip or top ridge off, flip it upside down and place it on the top of the neck planter that was put in place with the last step you completed. It will cover up a lot of the neck piece. Make sure it’s centered and pick four spots at the edge that you will be screwing it to the neck. Make sure two of those screw spots will be close to the back and will be hidden by the hair later. Countersink so the screws will be hidden a little into the pot’s plastic. It won’t be as much as countersinking into the wood because the planter is not as thick. It will just help with a later step in hiding the seams with caulk and spackle. Screw the head in place. Now take the last planter that is designated for the Fez and flip it upside down as well. You won’t need to cut the lip off of this one since it’s so small. Take a look at the picture below for step nine and notice the placement of the hat on the head. Note how the fez is high on the head and pushed back giving a big void behind the head. This is so the face will appear bigger and there will be a place to stuff the hair up into the hat. Screw in place the best you can wherever the fez is close to the head. you don’t need to worry about countersinking because the screws on the fez hat will be covered by ribbon. Almost ready for paint! Nose, belt and scepter installation. Nose-You should still have at least one quarter of the round foam you cut out for the toes. Slice a 3/4 in. section off so it’s flat on both sides. 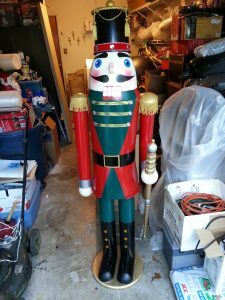 Pick the center of where there will be a face on the head of the nutcracker and trace out with a pencil where it will go. You will probably need to sand the back of the nose slightly where it fits against the curve of the head planter so the nose will have a tighter fit. I poked a couple of nails into the foam and drilled tiny holes for the nails on the corresponding position on the face so when glued with caulk the nose wouldn’t sag while drying. Let enough of the caulk ooze out the side and smear with your finger or spreader to give a tight seal. Belt-We will be using the 3.125 in. X 36 in. X .09 in. (thick) plexi glass for the belt. I actually bought a piece of 36 in. X 24 in. piece of plexi at Hobby Lobby. There was no UPC symbol or part number on the receipt, so that’s the best source I can give you. You can almost use anything similar to get the desired effect. The best way to cut this thin of material is with a straight edge and an exacto knife. You just have to score it and not go all the way through and snap it apart. With the 3 or 3.125 in wide by 36 in. 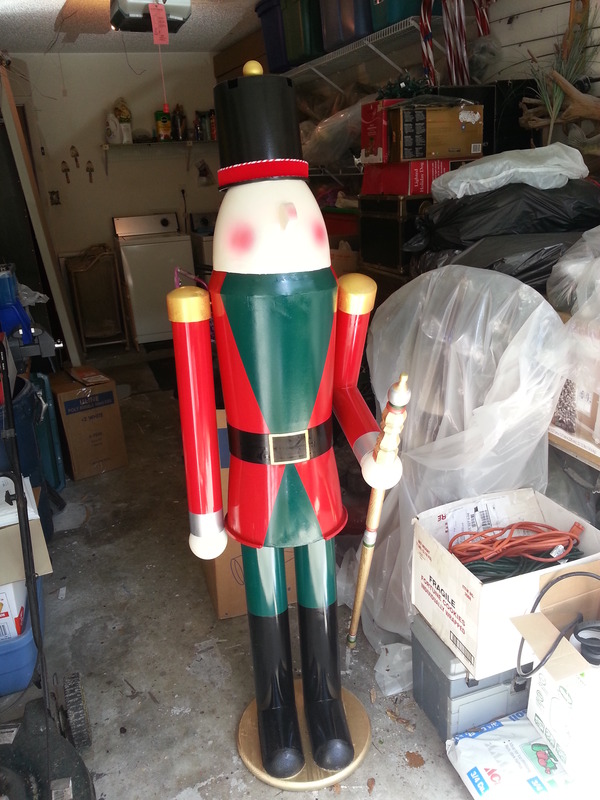 piece, wrap it around the nutcracker covering the seam between the lower body (valve box) and the upper body planter. 36 in. is about 4 in. larger than the body, but that’s good because you will need that to overlap in the back to secure the belt as one piece. Glue with the super glue the 4 in. overlapped section to itself. Do not secure it to the body yet. Next you will be screwing the belt to the upper body planter only if you want to have him rotate a quarter twist. Pre-drill two 1/8 in. holes at the top back of the belt preferably through the overlapped area where you just glued. You need to pre-drill the belt because it will crack or shatter if you don’t. Using the 1.25 in. screws, fasten the belt to the upper body planter. 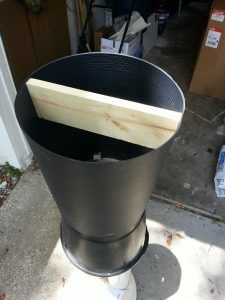 Scepter-Start by drilling a hole as thick as the 5/16 X 9 in. turnbuckle body through the center of one of the 4 in. styrofoam balls all the way through. Remove the hook and eye from the turnbuckle so the middle body is the only thing you’ll use and shove it in the hole you just created in the foam ball. It may be slightly shorter than the ball, but the threads of the finial and the chair leg will reach in to the threads of the turnbuckle body and will tighten nicely. Don’t put them on the hand yet till it’s installed completely on the arm. It will be lighter and easier just dealing with the ball without all the extra weight. You’ll be using the 3rd piece of 5/16 in threaded rod for the next step. Drill a slightly smaller hole than 5/16 into the ball hand perpendicular to the turnbuckle. Only drill half way through the ball-you’ll hit the turnbuckle anyway so you won’t be able to go all the way through. Screw in the threaded rod into the hole on the ball. Making the hole a little smaller will give a tight hold on the threaded rod since the foam will compress around the rod. Now drill a slightly larger hole into the wood inside the left arm bend in the center, at the wrist, long enough for the threaded rod to go in. You can inject a little caulk in the hole. This will hold the hand in place. For an extra added hold counter sink some holes at the end of the wrist outside the PVC close to where the ball enters the arm. Screw in at an angle towards the ball (slowly so the threads of the screw will bite into the foam) with the 1.25 in. screws. See picture below for visual instructions. T.b. represents the orange turnbuckle. T.r. represents the 5/16 in. threaded rod. The brown inside the lower arm is the wood, and the purple dots are the screws. Once the hand is in place, you can screw in the finial to the top of the foam ball hand and then screw on the chair leg to the bottom. Okay, almost ready to paint. There is still an important step that has to be addressed before any paint goes on him which is dealing with all the seams, screw heads, and any holes that you acquired during fabrication. Using the caulk, inject it into any large gap, seam and/or countersunk surface and smooth the caulk out with your finger or spreader. The caulk will shrink a little when it dries and then you’ll need to spread lightweight spackle over those same areas. Allow the spackle to dry completely and then sand the surface with 220 grit sand paper. I gave a list of the colors I used to paint my nutcracker, but you, of course, have the liberty to paint him however you choose. Pick a paint that is specifically designed to stick to plastic well. The PVC arms and legs should probably be primed first because I had an issue with the tape pulling some of the paint off. I have access to a compressor and an airbrush, so I airbrushed rosy red cheeks on the face before hand painting the face. Modern Masters gold was brushed on and not sprayed on his shoulders and belt buckle. Now let's make him look real by painting him. 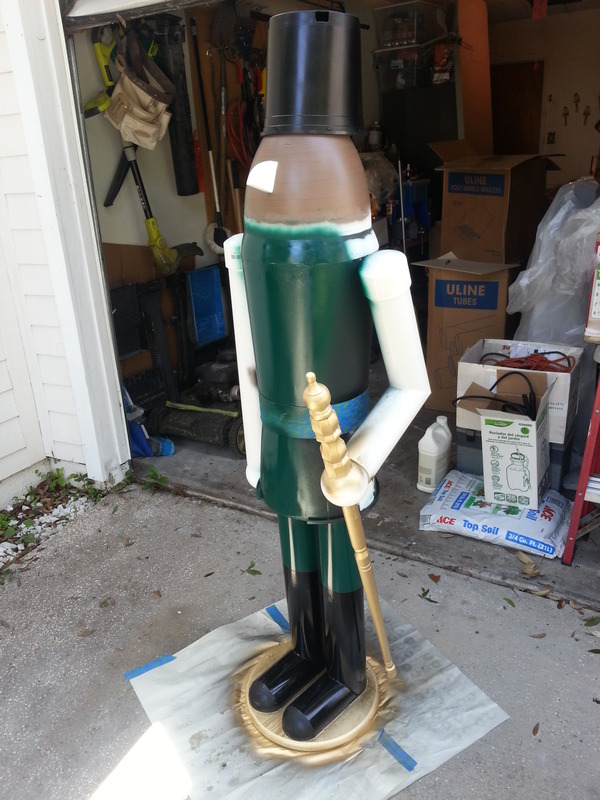 Custom hand painted classic design of nutcracker face. Now that the painting is done and fully dried the details can be applied to finish your masterpiece. Most of it will be fixed on using hot glue, so if you’re not familiar with how to us a hot glue gun try learning really quick. Be careful, THE TIP AND GLUE COMING OUT IS EXTREMELY HOT! Anything that wraps around, like the ribbon and rope for the Fez, or the fringe for the shoulder ranks need to be pre-measured before cutting. Once cut, glue in place. For the twisted gold rope at the top of the hat, I wrapped the gold tassels around it first before gluing on permanently. See above picture for placement of other add ons like the rhinestones. Of course, like the paint, you can do what ever you want to make it your own. Have fun. The absolute last step is the hair and beard which is made from the white leg warmers listed above. It only takes one of the two in the pair from the package so if you’re ambitious you have hair for another nutcracker some day. You’ll need to cut the warmer in half up from the opening to have one long complete hair layer to wrap around and tuck under the back of the Fez/hat opening. It will be a little too long and go past what you need, so this is where you get the beard material from. My beard on my nutcracker is approximately 4 in. wide by 7 in. long. Cut the beard out and hot glue under the painted mouth of the face and body. Cut the excess hair to fit around and inside with a proper look and glue in strategic places to keep the hair on the head but with a little flow or “body”. 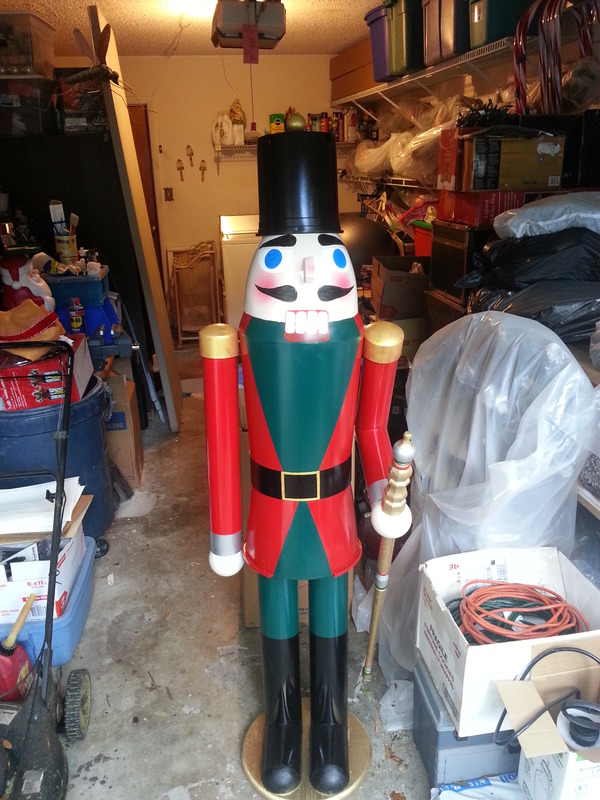 Once you finish your nutcracker, contact me and send me some pics. I’d be happy to post them here in my blog. Happy Crafting! Sure, my pleasure 🙂 If you have some pictures I’d be happy to show them off here.